This example requests a two-sided design similar to Example 101.2, but with a nonbinding beta boundary. With a nonbinding acceptance boundary, the trial does not need to stop to accept the null hypothesis when a test statistic falls in the acceptance region at interim stages. The design maintains the specified Type I error level, but at the cost of increased sample size. The STOP=BOTH option specifies early stopping to reject or accept the null hypothesis, and the BETABOUNDARY=NONBINDING suboption requests the nonbinding beta boundary. The "Design Information," "Method Information," and "Boundary Information" tables are displayed by default. The "Design Information" table in Output 101.13.1 displays design specifications and derived statistics such as power and maximum information. With a specified alternative reference, ALTREF=0.15, the maximum information is derived. With the BETABOUNDARY=NONBINDING option, there are two ways to compute the Type I error level: with or without the beta boundary. Alpha (Binding Beta Boundary) displays the Type I error level with the beta boundary, and Alpha (Nonbinding Beta Boundary) displays the Type I error level without the beta boundary. The maximum information is the information level at the final stage of the group sequential trial. The Max Information (Percent Fixed-Sample) row displays the maximum information for the sequential design expressed as a percentage of the information for the corresponding fixed-sample design (which has a Type I error level 0.025). In Output 101.13.1, Max Information (Percent Fixed-Sample) is 110.71%, which means that the information needed for the group sequential trial is 10.71% more than the information needed for the corresponding fixed-sample design if the trial does not stop at any interim stage. Compared to the corresponding design with a binding beta boundary, which has a Max Information (Percent Fixed-Sample) of 107.67% as displayed in Output 101.2.1, the nonbinding design requires a larger sample size if the trial proceeds to the final stage. The "Method Information" table in Output 101.13.2 displays the values of and , which are the parameters for the O’Brien-Fleming method. The table also displays the drift parameter 3.4107, which is greater than the drift parameter 3.3636 in the corresponding binding boundary design, as displayed in Output 101.2.2. The "Boundary Information" table in Output 101.13.3 displays information level, alternative reference, and boundary values at each stage. By default (or equivalently if you specify BOUNDARYSCALE=STDZ), the alternative reference and boundary values are displayed with the standardized Z statistic scale. The resulting standardized alternative reference at stage k is given by , where is the alternative reference and is the information level at stage k, for k= 1, 2, 3, 4. By default (or equivalently if you specify INFO=EQUAL), equally spaced information levels are used. With the derived maximum information, the actual information level at each stage is also displayed. With the SAMPLESIZE statement, the required sample size N is also displayed under the heading "Information Level." 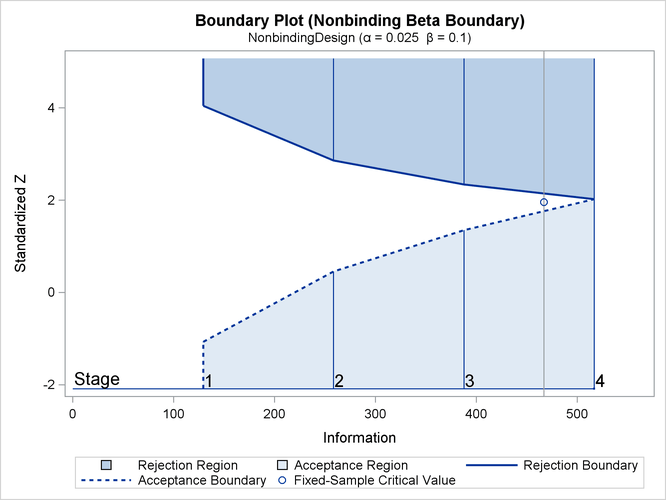 Note that with the standardized Z statistic scale, the rejection boundary values are identical to the boundary values that are derived in the corresponding design with early stopping to reject . With ODS Graphics enabled, a detailed boundary plot with the rejection and acceptance regions is displayed, as shown in Output 101.13.4. The horizontal axis indicates the information levels for the design. The stages are indicated by vertical lines with accompanying stage numbers. The boundary plot also displays the information level and the critical value for the corresponding fixed-sample design. The "Error Spending Information (Nonbinding Beta Boundary)" table in Output 101.13.5 displays cumulative error spending at each stage for each boundary. With a nonbinding beta boundary, the spending at each stage is computed by using the boundary only. The SEQDESIGN procedure derives the drift parameter , where is the alternative reference and is the maximum information. With the SAMPLESIZE statement, the maximum information is used to compute the required sample size for the study. The "Sample Size Summary" table in Output 101.13.6 displays parameters for the sample size computation. With the MODEL=TWOSAMPLEFREQ(NULLPROP=0.6 TEST=PROP) option in the SAMPLESIZE statement, the total sample size and expected sample sizes under the null and alternative hypotheses for testing the difference between two proportions are displayed. The "Sample Sizes (N)" table in Output 101.13.7 displays the required sample sizes at each stage, in both fractional and integer numbers. The derived fractional sample sizes are under the heading "Fractional N." These sample sizes are rounded up to integers under the heading "Ceiling N." As expected, the sample sizes in the table are larger than the corresponding sample sizes in the corresponding design with binding beta boundary.